An expert always takes care of his tools because he knows his tools take care of him. Danner boots are no exception and Danner Boot Dressing is the key to maintaining their quality. This premium dressing is formulated to keep leather from dying and cracking and should be used to recondition boots after hard use. Boot Dressing Compound is water resistant and allows for breathability. An expert always takes care of his tools because he knows his tools take care of him. 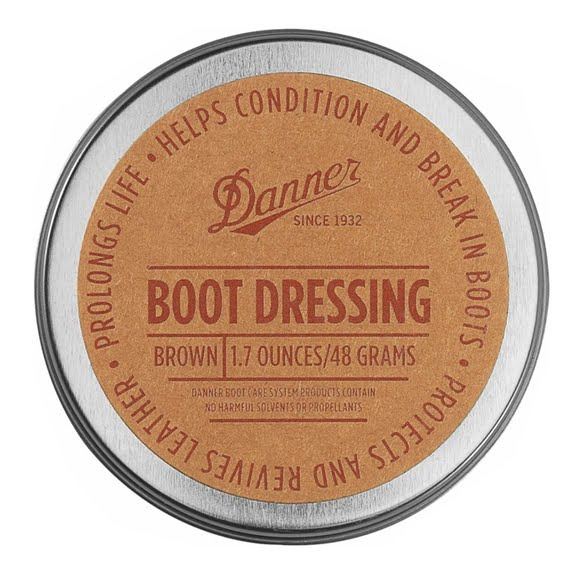 Danner boots are no exception and Danner Boot Dressing is the key to maintaining their quality. This premium dressing is formulated to keep leather from dying and cracking and should be used to recondition boots after hard use. Boot Dressing Compound is water resistant and allows for breathability. This is especially important to GORE-TEX boots, as the waterproof membrane needs to be able to breathe through the leather to work most efficiently. For use on full-grain leather only. For nubuck, suede or rough-out leather, try Danner&apos;s Waterproofing Spray.